? A PCB layer stack can help you minimize your circuit's vulnerability to external noise as well as minimize radiation and reduce impedance and crosstalk concerns on high-speed PCB layouts.
? The right PCB layer stack can enhance the Electromagnetic Compatibility of your design as well. Before designing a multi-layer PCB, designers need to first determine the circuit board structure based on the size of the circuit, the size of the circuit board, and the EMC requirements. That is, decide whether to use 4 layers or 6 layers. More layers of circuit boards. After the number of layers is determined, the placement of the inner layer and how to distribute different signals on these layers are determined. Planning the multilayer PCB stack-up configuration is one of the most important aspects in achieving the best possible performance of a product. A poorly designed substrate, with inappropriately selected materials, can degrade the electrical performance of signal transmission increasing emissions and crosstalk and can also make the product more susceptible to external noise. These issues can cause intermittent operation due to timing glitches and interference dramatically reducing the products performance and long term reliability. In contrast, a properly built PCB substrate can effectively reduce electromagnetic emissions, crosstalk and improve the signal integrity providing a low inductance power distribution network. And, looking from a fabrication point of view, can also improved manufacturability of the product. PCBWay manufactures multilayer circuit boards with layers in the range from 4 to 14 layers, board thickness from 0.4mm to 3.0mm, copper thickness from 1oz to 4oz, inner layer copper thickness from 1oz to 2oz, and minimal spacing between layers to 4mil. Following images present PCBWay's default layers stack-up of PCB service. 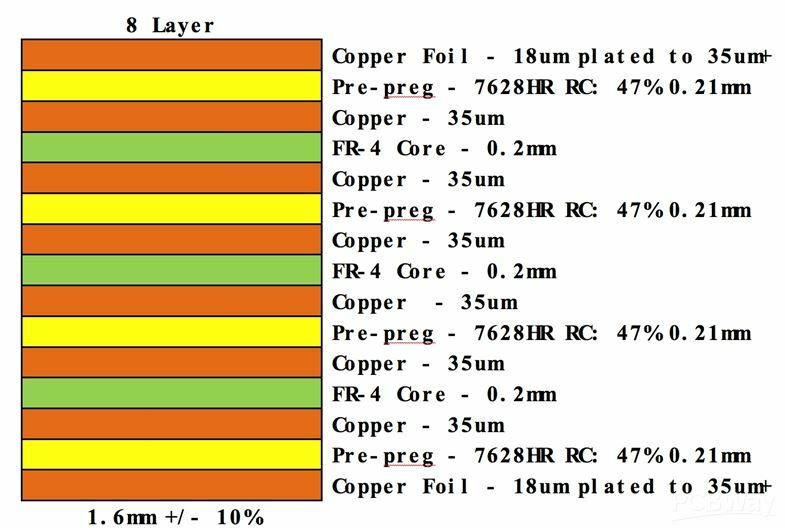 If you don't require customized PCB layer stackup, we will make the multilayer PCBs according to our default layers stackup as below.